JASPER -- Memorial Hospital and Healthcare Center is now a Level III Trauma Center. The verification from the American College of Surgeons, comes after years of work by hospital staff. Verified trauma centers must meet the essential criteria that ensure trauma care capability and institutional performance, as outlined by the American College of Surgeons' Committee on Trauma. It means Memorial will be able to treat more serious cases, transferring fewer to higher care facilities outside of the county. Jasper state senator Mark Messmer wrote a letter to the hospital congratulating the staff on becoming a Level III Trauma Center. 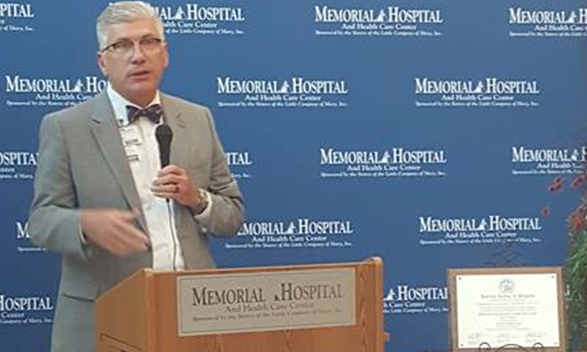 He added, "with the designation, an injured patient in our area will be able to receive their Level III trauma care right here at Memorial Hospital, rather than having to be transported to another hospital." There are only 22 Level III Trauma Centers in Indiana.